Make two lines at the end of the playing area and place the yellow bin of rings in between the two. 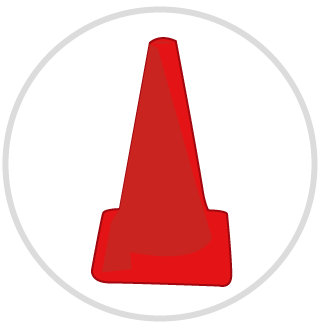 Place the cones as in the diagram, and the hoops in front of them. Set the timer for 2-minutes and then start it when you say “Go”. The first two students in each line must take one ring each, run up to the line of tape, stop, and try and throw their rings either on to the cones or into the hula hoops. 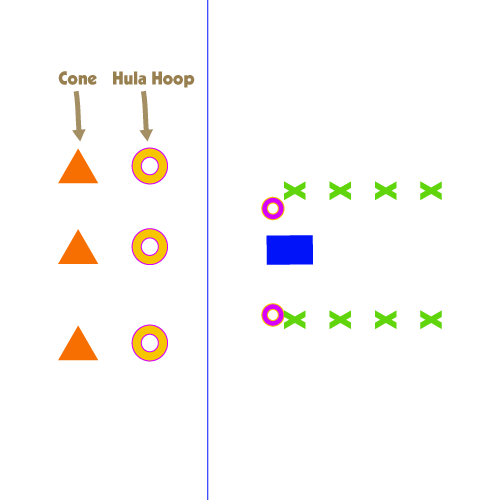 If they get it on the cones it is worth 3 points, if they get in inside the hula hoop, it is worth 1 point. Go for 2-minutes and then count the number of points. Do it as many times as you like and then write your highest point score on the board.